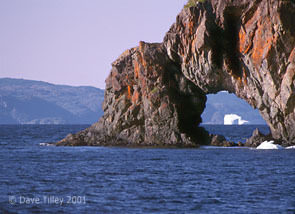 Photography of Wildlife & Natural Areas of Newfoundland, Icebergs & Arches. Sea stacks and arches formed by varied rates of weathering in different rock types, are common along the coast. The calving of 10,000 year old Greenland glaciers creates a flow of large icebergs that cross the North Atlantic to be swept by the tides of the Labrador current onto rocky shoals along the islands NE coast. Occasional strong NE breezes push the icebergs into the deep bays and inlets to be grounded and smashed against the rocks. The arch frames a distant iceberg. The grinding against the bottom causes an upwelling of microscopic plant material that fuel the food chain coinciding with the spawning of capelin and herring that are in turn consumed by overwintering whales who follow the fish to shore in spring.